India elevator guide rail processing manufacturer came to visit our factory - ZhangYun Machinery Manufacturing Co.,Ltd. 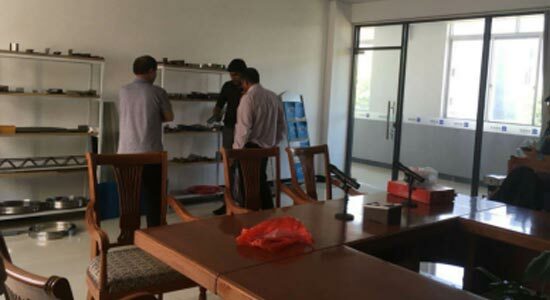 India elevator guide processing manufacturer came to visit our factory for consulting elevator guide rail processing auxiliary production line. Our company is the first enterprise in China that can independently design the production line of elevator guide rail processing equipment, and it is also the pioneer of domestic elevator guide rail processing technology innovation. It has long-term close cooperation with international brands such as Spain's Sevilla, Italy's Monte Ferro, Italy's Maraz in the domestic joint venture, and the national brand " Runfa-Machinery". The production line is highly integrated by uncoiling, leveling, forming, cutting off, punching, receiving and related process.The whole production line is controlled by PCL program. Operators can select a preset program to run the whole line automatically by using touch screen.The methods of operation include automatic control, manual control, separate operation and emergency stop .